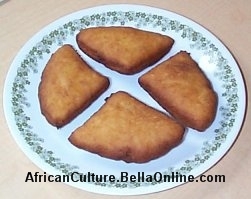 Usually mandazi are eaten with tea (chai) or coffee. Serve them warm for breakfast or for snack. Bring all ingredients to room temperature before mixing them together. Mix all the ingredients together, adding more flour if necessary. The dough should be soft, but not sticky. Roll the dough on a lightly floured board until it is about 1/4 inch think. Cut into triangles and fry in hot oil. Fry until both sides are golden brown. Remove mandazi from oil and drain on paper towels or newspaper. Mandazi are best served warm. * Sprinkle some powdered sugar over the hot mandazi. * Put some white sugar into a bag, add a couple mandazi, and shake the bag to cover the mandazi with sugar. * Add about a 1/2 teaspoon of cinnamon, ginger, all-spice, or cardamom to the dough or a combination of these spices to total a 1/2 teaspoon. * Use a circular donut cutter to make mandazi in the shape of traditional donuts. * Substitute pineapple, orange, or lemon juice for the milk. * Add some shredded coconut to the dough. * Add ground peanuts or ground almonds to the dough. * You may substitute 1 teaspoon dry yeast for the 2 teaspoons baking powder. You will want to allow the mandazi to rise before cutting shapes and frying. * Use 1/2 white flour and 1/2 wheat flour to make a healthier mandazi. * Try baking these in the oven at 350 degrees to reduce the amount of fat. * Substitute the white sugar with Splenda. * Substitute some plain yogurt for the egg. * Mash 1/2 an over-ripe banana and add to dough. You may want to reduce the amount of milk.